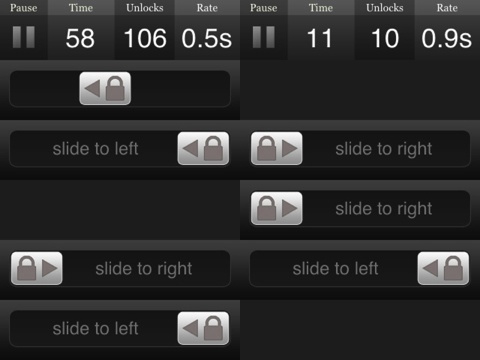 Have you ever unlocked your iPhone or iPod Touch and thought, “that was really fun?” Me neither, but the developers at ‘the falco initiative’ must have because they have a new application called “Slide to Unlock” where unlocking your phone is taken to the next level, which is now our WTF app of the week. The gameplay of “Slide to Unlock” is simple. Using the same graphics the iPhone uses to unlock your phone, “Slide to Unlock” tests your unlocking skills in four different modes. In Classic mode you exclusively slide to the right, Twist mode goes both left and right, Doubles mode forces you to unlock two at a time and finally there is revenge mode, which is a hard mode that utilizes doubles, left, and right at a faster speed. I downloaded the iPhone app for free on my iPhone 3GS and a minute later I was playing. While playing in the regular mode, I found myself getting bored after about a minute. Simply sliding a lock over to the right as fast as possible just wasn’t entertaining enough for me. Moving on to Twist mode was a bit more engaging. You never think about how much more difficult it would be to unlock your iPhone from right to left until you have to do it over and over again. Doubles and Revenge were about the same as Twist mode, only more difficult because there are more locks moving a lot quicker. As far as overall difficulty, “Slide to Unlock” is on the easy side. The difficulty of the game comes from endurance rather than skill. Playing on Revenge mode, I managed to play rounds lasting around 70-100 seconds before my screen was overwhelmed with locks and I found that time coincides with how long I would actually play this. On easier modes my time increased, but the problem is that the sliding motion is so monotonous, it feels more like a chore than a fun time. “Slide to Unlock” does have some nice features. It uses the OpenFeint network so you can see leader boards, add friends and compare your scores. Looking at the leader boards, I am amazed at other users determination. For example, my top score in Doubles mode was 342. The top score of the day was close to 3000, with a score of 685 rounding off the top 25. Like almost all games these days there are plenty of achievements to keep you playing, and I guess that is enough for some people. Overall, this has been a pretty negative review, but while “Slide to Unlock” felt too monotonous to be worthwhile for me, it is clear that there is a demographic out there it appeals to, so I don’t want to discourage others from trying it out, especially since it is free. AppSafari review of Slide to Unlock was written by Darius Reimm on February 13th, 2012 and categorized under App Store, Free, Games, Puzzler, WTF. Page viewed 5264 times, 2 so far today. Need help on using these apps? Please read the Help Page.